Danny, we are so happy that you and your friends enjoyed your time at River Bend Lodge. It is a great property for riding ATVs! We look forward to your return trip. Great place. Love the river. ATV riding is great. Ride in- ride out for atvs right at bull gap trailhead. Tom, we are so happy that you loved River Bend Lodge! It is a great spot for ATV riding. We look forward to seeing you again! Had a great stay! Would stay there again and recommend it to everyone! Judy, we're so happy that you enjoyed your stay at River Bend Lodge. Sitting on the swing over looking the water is total serenity. We hope to see you and your friends back again! Great Mio stay!-The cabin worked out perfectly for our family. Nice cabin with lots to offer - we stayed here for a family wedding in Mio. We hope to come back in the summer so we can float the river. Betty, we are so happy that River Bend Lodge was the perfect spot for your family, and we look forward to having you float the river next summer! Erika, we are so glad that you enjoyed your time at River Bend Lodge. It is small but mighty! We hope to see you again. Awesome Ausable-My wife and I and 3 children greatly enjoyed the River Bend Lodge over our 4 night stay. 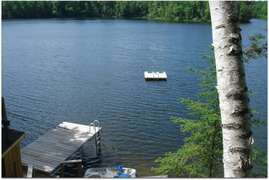 The location is right on the Ausable, where you can enjoy the quietness and beauty of the river and it's surroundings. It is located about 5 miles east of Mio, in the Huron-Manistee National Forest. There are enough neighbors around to feel comfortable, but still enjoy the privacy. The cabin has everything you need, and the Direct T.V. made it easier with the kids. Several canoe liveries are in town, 10 minutes away, or you could bring your own. Local lakes provide convenient swimming for the family. The only negative was the propane grill, that needed a serious clean up, and was in our opinion not usable. Otherwise this is a Michigan gem that we hope to re-visit next summer. John, we are so glad that River Bend Lodge was just what you were looking for. We really appreciate your thoughtful review, and we will look into the grill situation. We hope to see you again! Over all very nice-Very nice. Quiet relaxing . Cabin was nice lots of room. Good fishing and tubing, lots of wildlife. Had a very good time. Looking forward to renting again in the future. Kevin, we are so glad that you enjoyed the quiet of River Bend Lodge. The log cabin effect is pretty seductive, and being out in nature where you can actually see wildlife close by makes for a wonderful vacation spot. We'll look for you again! Vacation at river bend lodge-Had a good time. Lots of wildlife. Most likely be back . Kevin, we're glad that you had a good time at River Bend Lodge, and we hope to see you back again. Had a great time. It's a great place to get away and just relax. It's r third time up there. We love it. Karen we hope that you make it four times at River Bend Lodge! We are so glad that you had a great time. Excellent! A perfect relaxing getaway-We spent five blissful days staring out at the Au Sable River, cozying up by the fireplace, and staring up at the night sky. It was a perfect getaway from our busy lives in the city. 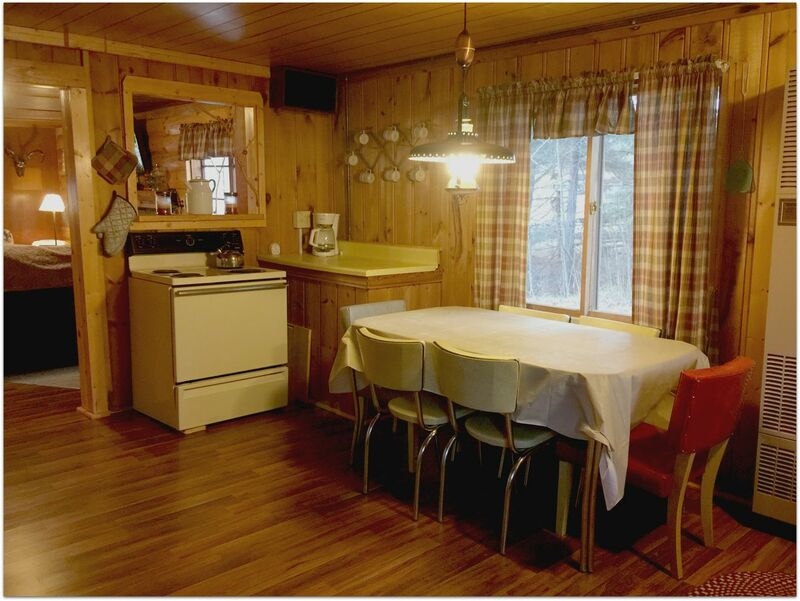 The cabin was fully furnished and had all of the cooking utensils we needed. Down the street we could buy loads of firewood for ten bucks and it was enough to keep the fires burning all week long. There was a swing outside, right on the river bend and we sat on it often. The nights were quiet, dark, and perfect for getting a great night's sleep. Definitely will be coming back! We are so happy that you had such a great "time away" at the Au Sable River. It certainly is relazing there! We have over 70 properties for you to choose from, and we give a 10% returning guest discount when you book directly through us. We hope to see you again soon. Girls Getaway-Perfect for our Girls Getaway! The River Bend Lodge was perfect for three old gals to get away from it all. Very peaceful and quiet, as very few cottages open in the winter. Loved watching the Common Mergansers dive for fish, then pop up in front of you, with the morning mist coming off the water. We unfortunately picked three super cold nights for our adventure. We ordered a cord of wood and had a fire in the fire pit outside and the fireplace inside the whole time--so cozy. The cabin was well stocked with supplies. We left the key in the lock box when we checked in--glad we did too because the door on the river side stays locked when you exit--and we locked ourselves out. A few suggestions: winter blankets vs summer blankets on the beds, waste baskets in the bedrooms, an alternative heat source for the bathroom, and a hatchet for making kindling (we had to buy one). We did have a plumbing issue in the kitchen that was promptly fixed. I would recommend the River Bend Lodge for those desiring a rustic getaway! 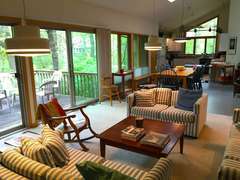 Perfect Girls Getaway-The River Bend Lodge was perfect for three old gals to get away from it all. Very peaceful and quiet, as very few cottages open in the winter. Loved watching the Common Mergansers dive for fish, then pop up in front of you, with the morning mist coming off the water. We unfortunately picked three super cold nights for our adventure. We ordered a cord of wood and had a fire in the fire pit outside and the fireplace inside the whole time--so cozy. The cabin was well stocked with supplies. We left the key in the lock box when we checked in--glad we did too because the door on the river side stays locked when you exit--and we locked ourselves out. A few suggestions: winter blankets vs summer blankets on the beds, waste baskets in the bedrooms, an alternative heat source for the bathroom, and a hatchet for making kindling (we had to buy one). We did have a plumbing issue in the kitchen that was promptly fixed. I would recommend the River Bend Lodge for those desiring a rustic getaway! So happy to hear that you enjoyed your stay. We will look into the issues that you described, and I'm glad that you received prompt service for the kitchen plumbing. We have 72 properties and give returning guests a 10% discount when they book directly through us. We look forward to working with you in the future! Cozy, clean cabin!-We really enjoyed our stay at your cabin. We were impressed with the cleanliness of it. The fireplace gave it a warm, cozy feeling, and it's a scenic location, right on the river. Loved it and will go back! Hi Chris! Thank you for taking the time to write a review of your stay at River Bend Lodge. We appreciate your comments regarding the cleanliness of the cabin. Our caretaker takes great pride in her work-we will most definitely pass your review on to her. Thank you again, and we look forward to your next vacation with Freshwater Vacation Rentals! Hi Chris! Thank you for taking the time to write a review of your stay at River Bend Lodge. We appreciate your comments regarding the cleanliness of the cabin. Our caretaker takes great pride in her work-we will most definitely pass your review on to her. The AuSable River is a beautiful place! Thank you again, and we look forward to your next vacation with Freshwater Vacation Rentals! Great place-Awesome setting, well furnished, comfortable place. Management was responsive to a slight issue with the TV. Took care of the issue immediately. Will stay there again. So happy to hear that you enjoyed your stay. Check out all 72 properties. We give returning guests a 10% discount when they book directly through us. We look forward to working with you in the future! This is our second time here. We love how the cabin is on the river. It's beautiful in the fall and winter and look forward to a summer visit. The door handle on the back door is very hard and not sure if it was locked. We are thrilled you enjoyed your stay with us. We love, love, love the colors in the fall. Thank you for the great, positive review! We do hope you book again in the future. Remember, we have 60 properties stacked around Michigan; please check out our website to see the newest homes and special deals. Great cabin and customer service!-2nd year staying at this cabin and it is awesome. More importantly, any interaction with the staff surpasses my expectations. Thanks! YEAH! We are thrilled that you enjoyed your stay! We agree, the house has so much to offer. Thank you for your compliments and comments. Very nice. Cozy and beautiful view. Would definitely rent this place again.-â˜… â˜… â˜… â˜… â˜… The contact people were very helpful and accommodating. The place was nice and cozy the view was absolutely beautiful. Thank you for you compliments. We love River Bend Lodge as well. The view is absolutely gorgeous. We hope you consider booking one of our other 54 waterfront properties next time you are scheduling your Michigan adventure! KAYAKING DREAM-The location of the cabin is perfect! The river is beautiful, and the cabin location I s perfect for launching kayaks. The fire pit in the backyard overlooking the river is picturesque. It is clean and well stocked. We vacationed with our children, so we especially appreciated the washer and dryer. We would definitely rent it again! Sounds like you guys had a wonderful time, which is great to hear! We are already booking for 2018, so give us a call if you wish to reserve some dates. Thank you for booking with Freshwater! Beautiful waterfront-â˜… â˜… â˜… â˜… â˜…Well equipped cabin for our family of five. Perfect! Great Weekend-As advertised. Great value. Relaxing riverside stay. Awesome get away for friends and family!-Everyone that stayed at the cabin off the ausable river had a great time! It was even better than we had thought if you want to enjoy a great place and have fun with family and friends this place will not disappoint! Winter weekend-We spent a weekend in the cabin. Was absolutely beautiful. Very clean and everything was there that you could of needed. Lots of room and a beautiful view of the river. We were able to contact owners with any issues immediately. I can't wait to come back with my kids. My friends and I (and our dogs) spent New Years weekend at Riverbend lodge. It was exactly the getaway we were looking for, and the location was perfect for hiking and coming back to relax by the fire. The river was beautiful and the lodge itself was very comfortable. We would definitely recommend it and hope to be back soon! Cottage was very cute and cozy. We had a relaxing time and enjoyed the scenic view out our back door of the beautiful Ausable river. Cottage was well equipped and staff was very helpful with all of our questions. Great Weekend-This is a great cabin on the river. Cabin was clean, and has everything you need while your there. We will be back again. Very nice "old Michigan cottage". One lightbulb needed replacement, and grill was burned out and unusable. Otherwise a wonderful experience. We had a great time and will use again.